Peacefully at Gateway Haven Wiarton on Sunday August 25, 2013 at the age of 83 years. Proud mother of Brenda Lihou, Diana (Derek Pocock), all of Oliphant, Brian Lihou, of Wiarton, and Paul Lihou (Lee-Anne), of Parkhead; step-mother to Judy, Gerry (Jerry Black), Jackie, John (Linda), Jim, and Jill Skene. Cherished grandmother of 6, and step-grandmother of 9; and great-grandmother of 3, and step-great-grandmother of 7. Dear sister of Alice Donnelly, and Kenneth Clemens (Eunice); and sister-in-law of Marj Smith, Helen Porter, Fairy Buchanan, and Joyce Skene. Predeceased by husbands Stewart "Bud" Skene and Wally Lihou; brother Wes Clemens; sister Ruby Deakins; 5 sisters-in-law; and 5 brothers-in-law. 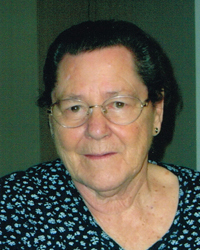 Family invite you to gather with them for a graveside service to be held Balsam Grove Cemetery, Oliphant on Wednesday, September 4, 2013 at 1:30 PM. Donations to Friends of Gateway or the Salvation Army Food Bank would be appreciated. Arrangements entrusted to the Thomas C. Whitcroft Funeral Home & Chapel, 814 Bruce Rd. 8, Sauble Beach (519) 422-0041.